Is antumbra part of shadow darker than penumbra part of shadow? I'm exploring different types of shadows casted by objects. I want to know if antumbra part of a shadow is darker than penumbra part. btw. Are there any reliable online references on that topic? In one sense there is no such thing as either a antumbra or penumbra. Neglecting minor diffraction effects, a point source of light is either visible from a given point or it is not visible from that point. In order to deal with an extended light source, like the Sun, we need to answer two questions to determine the light level at a point. First, what fraction of the Sun's surface is visible from the location in question? 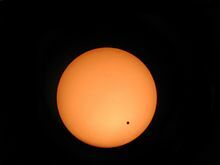 We are all in the antumbra of Venus or Mercury during a transit of the planet, but few of us would ever notice. The vast majority of the Sun's surface is unblocked during such a transit, and the light level here is only minutely affected. Secondly, we need to look at the brightness of those visible parts of the light source. A person who sees, say 1% of the Sun's surface at one point leading up to a total eclipse (penumbra) is seeing points close to the limb, and some points not so close. Someone viewing 1% of the Sun's surface during an annular eclipse (antumbra), is seeing points that average closer to the limb. 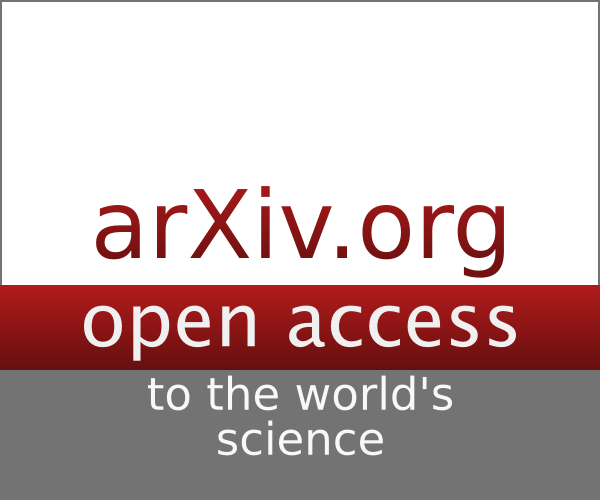 Since points closer to the limb are dimmer (see the image of the Sun in your first illustration), the second person would experience a dimmer light from the 1% value than expected. 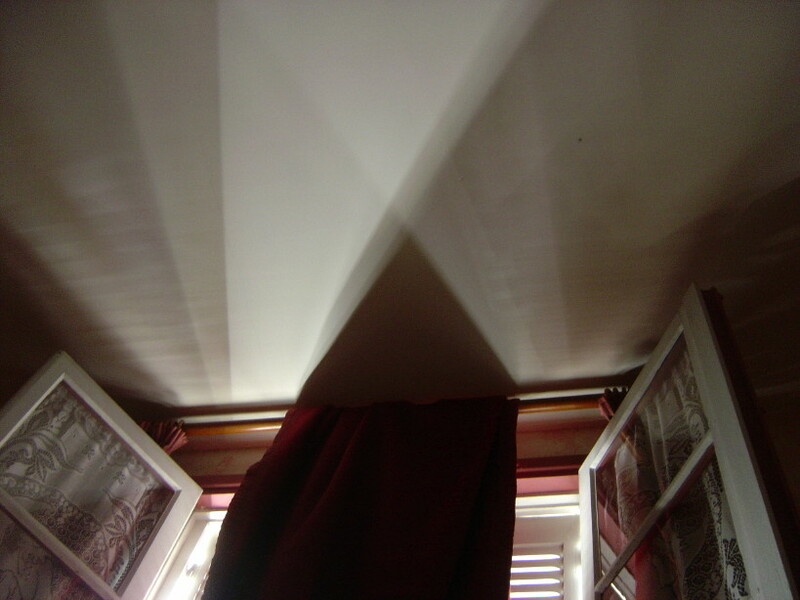 I think that last picture shows shadows cast by two light sources (the reflection in the window glass, perhaps?) Because the length of the umbra is just too short and the angles wrong for it to be due to a small, distant light source such as the sun. Perhaps an overcast day. 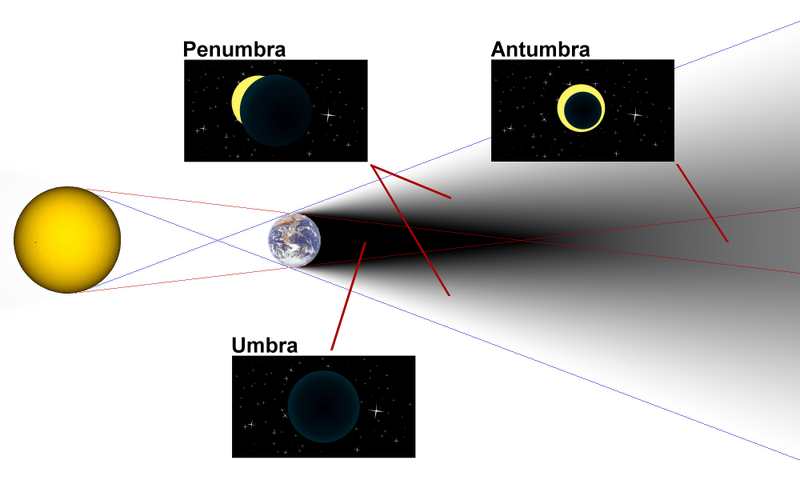 Furthermore, I think there are parts of the penumbra that are darker than the antumbra, and vice versa. You could probably qualify the question by specifying that it is a fixed radial distance from the light source. I'm going do do the annoying teacher thing where I answer a question with a question. Which is darker, a partial solar eclipse, in the penumbra of the moon, or a planetary transit, in the antumbra of an interior planet? Think of yourself on the dark side of the earth away from the sun. As you move further away from the earth you eventually get a ring of sunlight around the earth. You are then entering the antumbra. As you get further away from the earth the ring of sunlight gets larger and you see more of the sun. At the same time you are moving away from the sun so the amount of light you are receiving from the sun is smaller so the light gets dimmer. Eventually you see mostly the suns light with very little blocked by the earth. In the penumbral area, part of the disc of the moon obscures a section of the sun. In the antumbral area, the entire disc of the moon obscures a, logically, larger section of the sun. 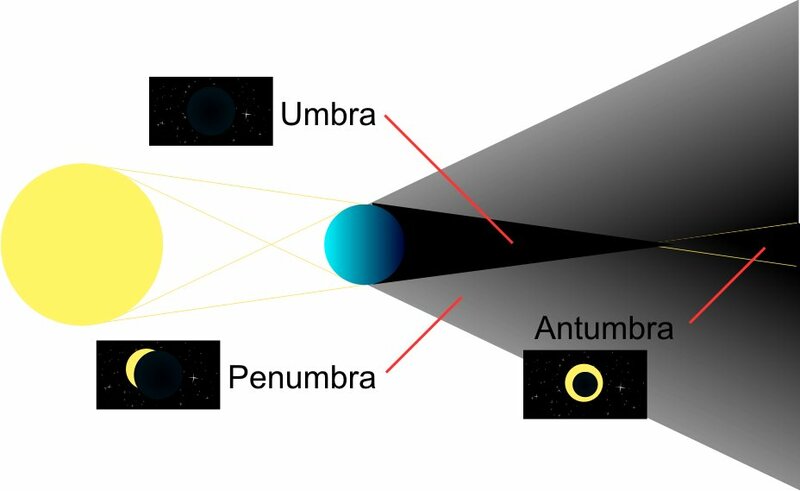 Therefore the antumbra cannot be brighter than the penumbra during the same event. Not the answer you're looking for? Browse other questions tagged optics astronomy visible-light or ask your own question. Why is blue darker than yellow in an analog black and white photograph? Why does a fabric become darker when is wet? Does a crescent moon cause (very faint) shadow bands? Can planetshine make the sky darker?